Hundreds of scientists and Mars-exploration enthusiasts will convene in a hotel ballroom just north of Los Angeles later this week to present, discuss and deliberate the future landing site for NASA's next Red Planet rover - Mars 2020. 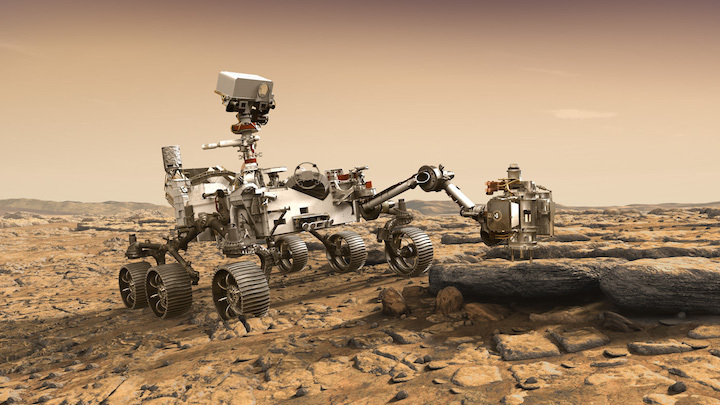 The three-day workshop is the fourth and final in a series designed to ensure NASA receives the broadest range of data and opinion from the scientific community before the agency chooses where to send the new rover. "The Mars 2020 landing site could set the stage for Mars exploration for the next decade," said Thomas Zurbuchen, Associate Administrator of the Science Mission Directorate at NASA Headquarters in Washington. "I'm looking forward to the spirited debate and critical input from the science and engineering community. Once returned to Earth, these samples will likely become the most analyzed soil samples in history, as they promise to address some very tantalizing questions driving NASA's Science program." Champions for four landing options will take their turn at the podium, presenting and defending their favorite parcel on the Red Planet. It is one more site than was expected after the completion of the third workshop, in 2017, where three locations on Mars were recommended for consideration - Columbia Hills, Jezero Crater and Northeast Syrtis. "At the end of the workshop in February of 2017, there were only three sites on our radar as potential Mars 2020 landing locations," said Ken Farley, project scientist of Mars 2020 at JPL. "But in the ensuing months, a proposal came forward for a landing site that is in between Jezero and Northeast Syrtis. Our goal is to get to the right site that provides the maximum science for Mars 2020, and this new site - dubbed 'Midway' - was viewed as worthy of being included in the discussions." "I have attended all the workshops so far, and none have disappointed when it comes to intelligent advocation and lively debate," said Farley. "But this is what science is all about - the cogent and respectable exchange of ideas. The passion of the participants shows just how much they care about Mars exploration. They know they are playing a key role in the process, and they know how important the landing site for Mars 2020 will be."